The year 1976 was a year of deciding where we were going with the Cushman parts. Yes, we had made enough off of our sales to buy my wife Merrie her new washer and dryer. But now she could hardly get to it, our basement, garage, and every spare bit of room had Cushman parts stored in it. Since there was still little demand for parts from scooter people, and the number of those running the Cushman motor in our Micro racing had dropped, I place a ad in our monthly racing paper, " The Pit Stop ", to sell our parts. Nothing came of it; I had several racers that wanted to buy some parts, but not all of them. 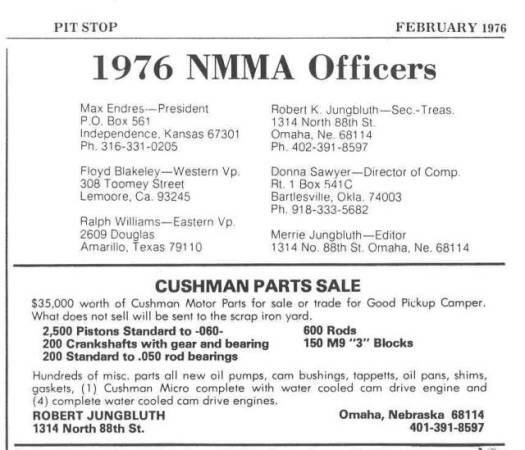 In 1978, one of my Cushman friends told me he had seen an ad for someone buying, and selling Cushman parts. I called Paul Covert in Dothan, Alabama, and explained what I had in the way of parts and what I wanted to sell, and he was like a kid in the candy store, " I will take them " he said. My first of many sales to Paul cleaned out much of the Truckster and transmission parts that I had bought from George Harnetz, and the 1,000 pistons, all of my stock of 2 5/8 and 2 7/8 inch bore pistons, and many 3 inch bore ones. A list of the parts I sold Paul is in our first letter in this series. Over the next 5 years I sold Paul Covert another 2,000 pistons, as well as a great deal of parts for the aluminum OMC scooter engine, many more M9 blocks, rods, and over 100 NOS part number 876355 clutch hubs with linings. Paul tells about the 2 1/2 tons of parts he bought from me to start his business in our Cushman Club of America magazine May - July 1993. I met Paul for the first time at the first National meet held in Lincoln, Nebraska. Paul was a salesman; I think he enjoyed meeting and helping people with their Cushman problems as much as selling the parts. Paul had some parts that I wanted to buy at the Lincoln meet. All day while I was selling parts he would come over or I would go over to where he was selling, and we would discuss the price. He did not want money; he wanted some of my parts, but always a little more than I wanted to give. When the meet was over I gave him what I thought was a good offer for his parts and he said "here, take them, you have help me so much, I want you to have these two chrome shrouds for your Eagle Scooter " Yes, I could have had more of these if I had asked Cliff years before, but now the scooter bug had bitten me, and would never let me go. Paul ran a great Cushman parts operation, but he could be hard nose about price when he had to. I think back at the thousands of miles he and his wife Shirley drove to find and buy NOS parts, and many times find the parts were already gone. He spent hours finding people who could make mufflers, sheet metal parts and things that we needed to put scooters on the road again. Paul help save the Cushman. Ed Note: See Bob's ad below and guess what it would worth today!